Well over a month since last blog, what has happened? Well mainly rain I think. All those rain dances we did early on certainly worked, but how doe we turn the tap off and the heat up? Must admit the last few weeks have been harder work than all the winter put together, fields just laying with water, horses stodging ground in, what a miserable time its been. As I type this Richard is rolling the fields trying to get rid of the damage. 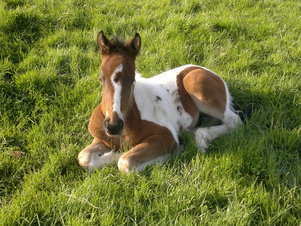 Better news during this time, which those that follow us on facebook will know, is that we had 3 more foals born. 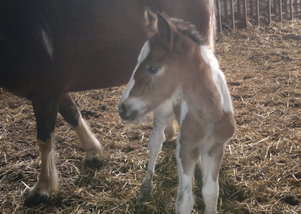 First came Mowgli on 17th April, a beautiful Colt by our lovely old boy King, then followed by Mermaid on 20th April, filly by Thomas, and lastly Martha on 26th April, the 4th filly by Thomas. We are very very pleased with the foals that Thomas has produced, we had been thinking about selling the young man but seeing what he produces has changed our minds. 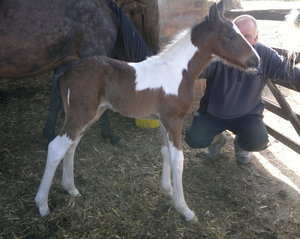 He is managing to serve our bigger mares so thats a bonus!! Talking of King, he is out in field with 19 mares now, we finally managed to turn the last of these out this week, I'm really not sure if my initial thoughts that he had managed to get a few mares in foal last year will come to fruition. Am hoping maybe one or two may produce babies in next couple of weeks, but looking more certain that Shoey will be the Daddy of several now. But King is more sprightly this year than last so still keeping everything crossed that he will manage to do something, if not then Mowgli will be his last foal, very sad as his babies are all turning out so gorgeous. Have had a few more liveries come along , they are all settling in , getting to know who gets on well best with who takes a little while but now have some nice happy groups out there. We are hoping to be able to get our livery numbers up to around 20, will be sorting out more accommodation for them this Summer, so able to fit them all in over the winter if needed. Date for our open day will be arranged shortly. It will be difficult to choose a day that suita everyone I know, will need to be a weekend I imagine, so bound to coincide with horse shows etc, we will do our best to not clash with anything major. So lets all hope for some nice warm, dry weather to cheer us all up again, and also because the new babies will be being born outside.